Waist training trend is becoming more and more popular day by day. Waist training lets you reduce your waist size and give prominence to the waist curves. All this is done with the assistance of waist trainer or corset. Women use this garment to give their waist a great shape. But there is a substantial question: how can you train your waist efficiently? Before you start your journey of waist training, there are two things to keep in mind: choose your right waist trainer and train in a healthy and safe way. Constant compression on the waist area will result in body shift. The more your body is compressed, the faster the results are. However, Poor fitting corsets will not only make you feel uncomfortable, but they also won’t bring quick results. For this reason, you need proper guidance to make it work efficiently because this garment is available according to different body types and are in various sizes. To get the right size, you require some measurements. To take the measurement of your waist, you need to make sure that any layer of clothing is not added to your size. Find your waist through fingers that are right at the base of your rib cage and at the top of the hip bone. Stand up and measure the waist with tape. Do not inhale while measuring. Note down your exact size. The precise measurement is a prerequisite for successful results. Usually, charts are available that help you find the waist trainer precisely of your size. However, when you don’t have a waist trainer that matches your waist size, or if you are facing the problem of having a size in between the available ones, you better take the larger one. Don’t assume that using a small scale in the first place will give you the best training results. Instead, it will damage your body without the desired effect. It’s better to wait until your waist is smaller than it was at first, and then select a small scale to ensure efficiency. Moreover, you can get the custom-made waist trainer as it is also recommended by Dita Von Teese who has a beautifully shaped body. She thinks that a corset should be of perfect size if you would like to get remarkable results. Poor fitting corsets cannot give satisfactory results, but if you ‘re between sizes and can’t get a custom waist trainer, still remember to choose the slightly bigger one. 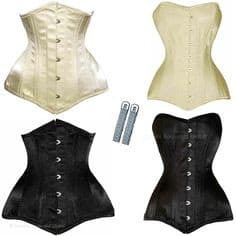 Corsets are available in a variety of styles. These are designed differently for several shapes of the body. You require to find out which form is best for you. There is no point of wearing a corset until its style is not comfortable. However, your upper rib cage can be uncomfortable in the initial hours, but it does not mean that you should stop using it. Compression causes a bit discomfort. It is all right until it blocks your breathing. Women usually have celebrity regime fascination that makes them follow their trends like buying Brittany Spears perfumes, their entire make-up kits, Gwyneth Paltrow exercise DVDs. Every woman wants to have a figure like Kim Kardashian. Waist trainer offered by her is one of the famous waist trainers. Waist trainers are distinguished by sizes, shapes, curves, and fabric. There are two main types of waist trainers: the waist training corsets and waist cinchers. The two look very much alike in appearance, but the former uses solid boning steel, providing better control; the latter contains flexible plastic boning, working well enough to make it easy for you to do any activity during the day. Those women who like their bodies to be extremely compressed can go for aggressive waist trainers. Fashion corsets come in beautiful designs and are very flexible. They are not waist cincher like steel-boned corsets which are made up of durable latex fabric. Then there is a corset with spiral steel bone. It ‘s best to have a try before you commit one. Grab the one that is more comfortable and precisely according to your needs. Select a convenient time and don’t forget to check the following things when you are wearing a shaper. It should be close-fitting and tight enough to hold your waist. It should not be too small. It should not cause any pain or interfere your breathing. The shaper should be appropriately closed. You should get the comfortable and right size. Seasoning is sort of a marinating. First time when you break in your corset, do not tighten it so much that you cannot even put your finger in it. Make yourself comfortable and have some PG-rated fun time. You can stretch it a bit after wearing it for a few hours. Do it several times after your first attempt. Initially, the compression feels uncomfortable, but you get used to it after proper breaking in. Neither wear the trainer for an extended period nor wear it for only a few minutes. During the first several days of breaking it, make it for 1.5-2 hours. Remove it after two hours as some Pavlovian negative reinforcement punishment. The time can be increased gradually. Let your body feel liberated. After almost 15 days of using it, you will feel a big difference and can wear for 7 hours or even more. Now, you can also post a Kim-K-esque Paper Mag picture. Don’t compromise on the quality of your waist trainer. Even some low-quality shapers can give a look of a Sarah Paulson’s costume from ‘American Horror Story.’ However, if the quality is not good, you might be wasting your time on that. If you want desired results, get a high-quality corset. Corset training experts give you proper guidance about the quality, size, and shape. You might have heard about adverse effects of waist training, but there are ways you can do it efficiently and securely. Corset/ waist training experts can also guide you through this. Do not be over enthusiastic with the intention to make your body perfect instantly. It is not going to happen because it is a gradual process. A break is required even if you opt for aggressive waist trainer. Get a break after using it for various hours. If you have worn this for more than enough hours someday, you can lessen the duration next day. Waist training is not a kind of magical weight loss pill that will exaggerate your body shape in just one day. You require adding something to it. We all know about the paybacks of exercise. If you make a combination of exercise and waist training, it can give you terrific results. Core strengthening exercises provide the best results. A healthy diet is also essential. All this make you feel great even if you are out of your corset. The people who have experienced waist training and are successful, have not achieved it without a proper diet and exercise. If you try too much too fast, you run the risk of hurting yourself and your corset, and haste makes waste. It is recommended that you slowly increase the wearing tightness and duration to ensure valid results in a healthy condition. You have to take care of several things while doing waist training. Make sure that this shaper is not affecting you in a wrong way. You would get guidance about how you should use a waist trainer, but you should have an idea about what you should not do. Exercise along with waist training is good, but it does not mean that you should do both the things at the same time. Never wear your corset while doing exercise. Most of the training experts do not recommend a workout with a corset on your body as it has adverse effects on your body. 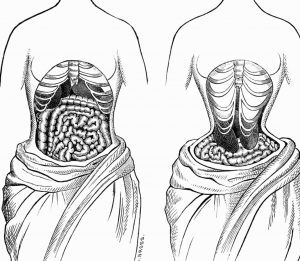 If you think that fashion corsets can achieve the purpose of cinching as well as looking great, you are on the wrong track. Fashion corsets are very flexible, and they do not cinch your waist. These are designed only to look good. All the lingerie and fashion corset are of no help in compressing. They give your body shape, but it does not help in FUPA (fat upper pubic area) fat spilling. The fabric utilized in the making of a waist trainer is latex. Latex does not suit everyone. Give it a try and if you feel that it is causing allergy, stop using it. That is not sure for those who are allergic to latex. You might not be comfortable with letting others know that you are using waist trainer. You can try stealth corseting. You can wear your corset underneath your outfit. Some outfits like lightweight knits and thinner blouses will not conceal what you are wearing underneath. Choose the gear that can wholly hide your shaper and give your body a good shape. When you work all day in office, it gets complicated for you to wear the shaper in the daytime. It gets very uncomfortable when you sit. That will not let you concentrate and work properly. In that scenario, you can get the advantage out of it when you are sleeping. In addition to that, it can be used in office once you get used to it. If you would like waist training when you are sleeping, lace up your corset one or a half inch lesser than you do in the daytime. If you feel uncomfortable in the midway of corseting overnight, get a break or lose your shaper. Persistence is essential to success. Get yourself into action and make waist training your daily routine. Always remind yourself to wear a waist trainer and track your progress to stay motivated. If possible, try pulling in a partner to prod each other along. We believe you will succeed.